In a dark room observing a group of unfamiliar faces, he came up to me and placed a pin on the lapel of my suit. After the meeting and greeting of all the brothers in the fraternity, he stopped by to say farewell and that he'll be in touch with me throughout the semester. One week later, we met up for our big bro and little bro interview. It was in the Hilton Lobby at Loyola Marymount University, where we had the chance to get to know each other's background, interests and involvement. Throughout our conversation, I kept thinking to myself, "He's a great egg." From his dedication to service, genuine personality, sense of humor and openness, I respected him as a friend and thought maybe one day, I will meet someone just as great as him. 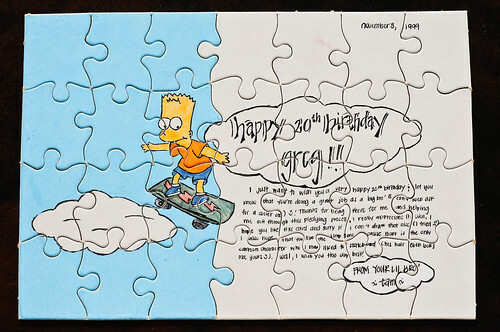 For his 20th birthday, I bought a blank puzzle card and drew a picture with a message for him to piece together. Ten years later, I just want to remind him that he is still the great egg I met the first time. Happy 30th Birthday Greg...I am grateful to celebrate your life.